We consider fluctuation relations between the transport coefficients of a spintronic system where magnetic interactions play a crucial role. We investigate a prototypical spintronic device - a spin-diode - which consists of an interacting resonant level coupled to two ferromagnetic electrodes. 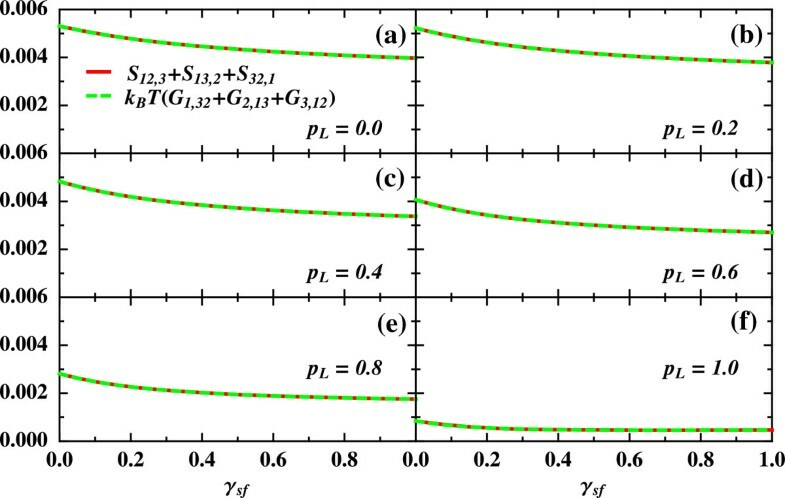 We thereby obtain the cumulant generating function for the spin transport in the sequential tunnelling regime. We demonstrate the fulfilment of the nonlinear fluctuation relations when up and down spin currents are correlated in the presence of both spin-flip processes and external magnetic fields. Nonequilibrium fluctuation relations overcome the limitations of linear response theory and yield a complete set of relations that connect different transport coefficients out of equilibrium using higher-order response functions [1–7]. Even in the presence of symmetry-breaking fields, it is possible to derive nonlinear fluctuation relations from the microreversibility principle applied to the scattering matrix at equilibrium . A possible source of time-reversal symmetry breaking are magnetized leads. Then, it is necessary to include in the general formulation the spin degree of freedom, which is an essential ingredient in spintronic applications  such as spin-filters  and spin-diodes [10–17]. We recently proved nonequilibrium fluctuation relations valid for spintronic systems , fully taking into account spin-polarized leads, magnetic fields, and spin-flip processes. Here, we investigate a spin diode system and explicitly demonstrate that the spintronic fluctuation relations are satisfied. Furthermore, we calculate the spin noise (correlations of the spin-polarized currents) and discuss its main properties. Consider a quantum dot coupled via tunnel barriers to two ferromagnetic leads α=L,R, as shown in Figure 1a. The leads have spin-dependent density of states ρα ↑(ω)≠ρα ↓(ω) (flat density of states are depicted in Figure 1a). For convenience, we introduce the leads’ spin polarization parameter as p α =(ρ α ↑−ρ α ↓ )/(ρ α ↑ +ρ α ↓ ). In the limit of Δε ≳ k B T , | eV | (Δε is the dot level spacing, k B is the Boltzmann constant, and T is the temperature) effectively only a single energy level ε σ (σ=↑,↓) in the dot contributes to the transport and can be occupied by 0, 1, or 2 electron charges. In the presence of an external magnetic field B, the Zeeman splitting is ε ↑ −ε ↓ =g μ B B (g is the Landé factor and μ B = qℏ / 2 m is the Bohr magneton, with q as the electron charge). Tunneling between lead α and the dot yields a level broadening given by Γ α σ (ω)=Π ρ α σ |V α |2 (V α is the lead-dot tunneling amplitude). Notice that the level width is then spin-dependent due to the spin asymmetry of the density of states: Γ α σ =(Γ/2)(1+s p α ), with Γ=Γ L =Γ R and s=+(−) for ↑(↓). Sketches of the spin diode system and electrostatic model. (a) Sketch of the spin diode system. The dot level is attached to two ferromagnetic contacts. V L σ and V R σ indicate the spin-dependent bias voltages applied to the left (L) and (R) right contacts, respectively. The dot level is spin split by a magnetic field B: ε ↑ ≠ε ↓ . Both spin-dependent energy levels are connected by spin-flip processes with a rate given by γsf. (b) Electrostatic model: ϕ ↑ , and ϕ ↓ are the dot internal potentials calculated using capacitance couplings [ C u i , C d i (i=1⋯4), C] within an electrostatic model. where Γ ασ ± = Γ ασ f ± ( μ 0 σ − e V ασ ) , Γ ~ ασ ± = Γ ασ f ± ( μ 1 σ − e V ασ ) , and f±(ε)=1/[ exp(±ε/k B T)+1]. Here, V α σ is a spin-dependent voltage bias, and μ i σ is the dot electrochemical potential to be determined from the electrostatic model. i=0,1 is an index that takes into account the charge state of the dot. Then, the cumulant generating function in the long time limit is given by F ( χ ; t ) = λ 0 ( χ ) t , where λ0(χ) denotes the minimum eigenvalue of W ( χ ) that develops adiabatically from 0 with χ. From the generating function, all transport cumulants are obtained . We consider a gauge-invariant electrostatic model that treats interactions within a mean-field approach . For the geometry sketched in Figure 1b, we employ the discrete Poisson equations for the charges Q ↑ and Q ↓ : Q ↑ =Cu 1(ϕ ↑ −V L ↑ )+Cu 2(ϕ ↑ −V L ↓ )+Cu 3(ϕ ↑ −V R ↑ )+Cu 4(ϕ ↑ −V R ↓ )+C(ϕ ↑ −ϕ ↓ ) and Q ↓ =Cd 1(ϕ ↓ −V L ↑ )+Cd 2(ϕ ↓ −V L ↓ )+Cd 3(ϕ ↓ −V R ↑ )+Cd 4(ϕ ↓ −V R ↓ )+C(ϕ ↓ −ϕ ↑ ), where C ℓ i represent capacitance couplings for ℓ=u/d and i=1⋯4. We then find the potential energies for both spin orientations, U σ ( N σ , N σ ̄ ) = ∫ 0 q N σ d Q σ ϕ σ ( Q σ ̄ , Q σ ) , N σ being the excess electrons in the dot. For an empty dot, i.e., N ↑ =N ↓ =0, its electrochemical potential for the spin ↑ or ↓ level can be written as μ0σ=ε σ +U σ (1,0)−U σ (0,0). This is the energy required to add one electron into the spin ↑ or ↓ level when both spin levels are empty. Importantly, our results are gauge invariant since they depend on potential differences ( V ασ − V α ′ σ ′ ) only. When the dot is charged, then N ↑ =1 or N ↓ =1, and we find μ 1 σ = μ 0 σ + 2 q 2 / C ~ , with C ~ = K / C and K = ∑ i C ui ∑ j C dj + C ∑ ℓ = u / d ∑ i C ℓi . S αβ ≡ 〈 Δ I α Δ I β 〉 = S αβ ( 0 ) + ∑ γ S αβ , γ V γ . C αβγ ( 0 ) = k B T S αβ , γ + S αγ , β + S βγ , α − ( k B T ) 2 G α , βγ + G β , αγ + G γ , αβ . We analyze a quantum dot attached to both a ferromagnetic lead with polarization p L =p and a normal lead with polarization p R =0. We take into account the presence of spin-flip processes described by γsf. In Figure 2, we explicitly check the fulfilment of Equation 4 for different values of the lead polarization in the general case of a spin-dependent bias configuration: V L ↑ =V1, V L ↓ =V2, V R ↑ =V3, V R ↓ =V4. When the dot is subjected to an externally applied magnetic field, one must consider the antisymmetrized version of Equation 4 using A−=A(B)−A(−B), where A can be G, S, or higher order correlation functions ( C − ( 0 ) = 0 for an energy-independent scattering matrix as in our system). Importantly, the checked relations involve terms of current cross correlations at different spin channels. The occurrence of nonvanishing cross correlations appears when spin-flip processes correlate the spin channels. Remarkably, only when these cross correlations are not zero, the nonlinear relations are nontrivially satisfied. Verification of spintronic fluctuation relations, Equation 4. Parameters: Γ0=1, q2/C0=40Γ0 (C u i =C d i =C0), C=∞, ε d =0, p L =p≠0, p R =0, k B T=5Γ0, and g μ B B=0.1Γ0. F L↑L↑ = 1 − 2 9 ( 1 + p ) for q V SD > + 2 | ε eff | 1 + 2 ( 1 + p ) ( 4 p − p 2 − 1 ) + 2 ( p − 2 ) γ sf / Γ 0 − 4 ( γ sf / Γ 0 ) 2 ( 3 − p 2 ) + 6 γ sf / Γ 0 2 for q V SD < − 2 | ε eff | . Notably, the Fano factor is always sub-Poissonian whenever ε eff lies inside the transport window. This is due to correlations induced by Coulomb interactions . Nonequilibrium fluctuation relations nicely connect nonlinear conductances with noise susceptibilities. We have derived spintronic fluctuation relations for a prototypical spintronic system: a spin diode consisting of a quantum dot attached to two ferromagnetic contacts. We have additionally investigated the fulfilment of such relations when both spin-flip processes inside the dot and an external magnetic field are present in the sample. We have also inferred exact analytical expressions for the spin noise current correlations and the Fano factor. Further extensions of our work might consider noncollinear magnetizations and energy dependent tunneling rates. This work was supported by MINECO Grants No. FIS2011-2352 and CSD2007–00042 (CPAN), CAIB and FEDER. RL and DS defined the research subject. JSL and RL performed the calculations. All authors discussed the results and co-wrote the paper. All authors read and approved the final manuscript.